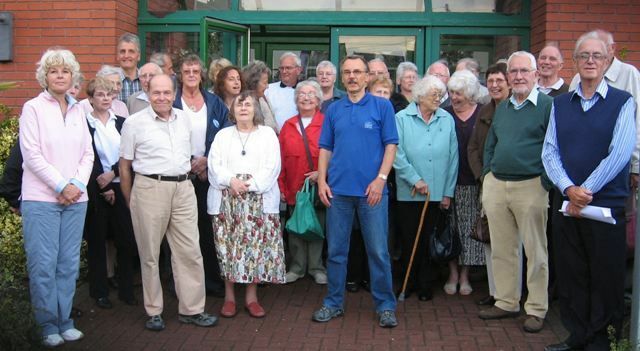 The Rodbourne Community History Group comprises mainly local residents who attend monthly meetings at Even Swindon Community Centre, Jennings Street, Swindon. We started out as the Rodbourne Living Story Project in 2003. This was a pilot community history project started by the Outreach Dept. of English Heritage’s National Monuments Record Centre in Swindon. If you wanted to pilot a community based history project where better than on your doorstep and that’s why English Heritage chose Rodbourne. Jane Golding – Outreach Manager with her staff Elaine Davis and Ros Wilson originally staged an exhibition in the Even Swindon Community Centre and appealed for volunteers to produce a digital archive for the community of Rodbourne. Being Rodbourne they had no problem obtaining volunteers and these set about the task with the essential guidance from Jane & Co.
After a year we staged our first exhibition which attracted 700 over two days. The success of the project persuaded English Heritage to financially support the project for a further two years in which time feature and oral history videos were produced. Funding isn’t forever and in 2005 we had to go it alone and formed the Rodbourne Community History Group. Go it alone is probably a little dramatic as we still had the wonderful support of Jane, Elaine and Ros. Lets face it if we hadn’t had their help and English Heritages funding we wouldn’t have had a cat in hells chance of surviving. So we will be eternally grateful for their support. Having received a grant from the Lottery Fund’s Awards for All scheme we purchased equipment to continue our aim (by means of donated photographs, audio recordings and filming) to make a permanent record of the community for the community. We have now generated a rich archive of over 2,500 photographs, several filmed interviews and an abundance of information transcribed from original documents which were stored in many of the area’s record offices. Probably our most valuable archive are the recorded memories of residents past and present of Rodbourne. We hope you will enjoy this glimpse into the past and after reading the stories you’ll join our group. Although the faces of the people have changed and the houses are different colours the strong community spirit is still going strong and long may it continue.